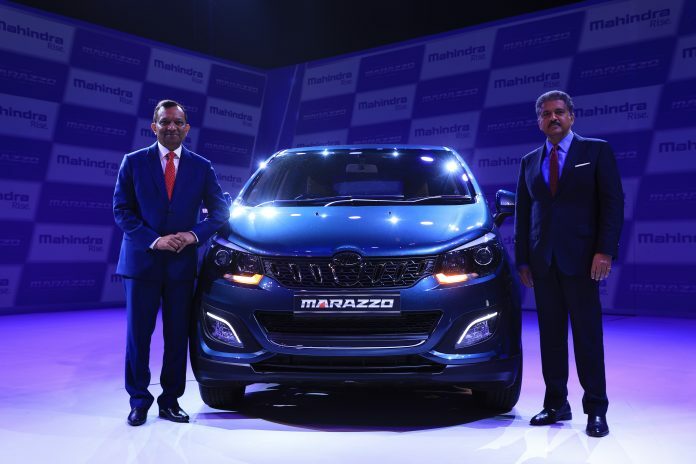 Mahindra has finally launched its new warrior for the MPV segment, the Marazzo. The car will be offered at an introductory price starting at Rs.9.99 Lakhs. It will be available in 4 variants namely, M2, M4, M6 & M8. As we know from before, the car will be offered in a 7 and 8 seat configuration. The 8 seater version will only be available on the lower three variants. These will be Rs. 5,000 costlier than their 7 seater siblings. As we know from the name unveil, the car’s design is inspired by a shark. It will be competing against the real shark of the MPV segment, the Toyota Innova on one end and Maruti Ertiga & Renault Lodgy on the other. Mahindra has added a lot of features on the car and at the same time priced it pretty well. It undercuts the Innova by a huge margin in terms of pricing. We now need to see how much it will take the market share away from the segment leader. Rajan Wadhera, President – Automotive Sector, Mahindra & Mahindra Ltd., mentioned,“This is a very proud moment for us, as the Marazzo turns a new leaf in Mahindra’s evolution in the UV segment. It has always been our endeavour to offer breakthrough products and category creators. With the Marazzo, we will continue our legacy. I am sure that Marazzo, with its excellent proposition of distinctive styling, plush ride, agile handling, luxurious space, refined NVH levels and attractive launch price is poised to emerge a winner”. Marazzo will come powered by a 1.5L four-cylinder diesel engine which produces 121BHP power and 300 Nm torque. This will come mated to a 6-speed manual gearbox. There is no word about the autobox as yet. This engine is designed for low noise and the car boasts of very low NVH levels inside the cabin of only 43 decibels (driver ear noise at low idle). The ARAI certified mileage rating of the car is 17.3 Kmpl.